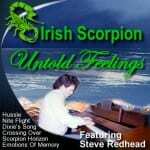 Untold Feelings is a collection of my first work as a composer. Most if not all of the songs were written almost 20 to 30 years ago. Yet even today the melodies being played tap an instantaneous reaction of emotions or feelings as if a video was replayed as well. Music is a universal language world wide. When you can capture a moment in time or life and put it into a melody that can be felt by any who listen and can feel contempt in their own special way, I feel as if I done what God has given me the gift to do. Enjoy……..I give special thanks to my best friend Terri. My brother and sister Scott and Cindy, my very long time friend Mona, my kids, Sarah and her husband Fred, and my true friend David for keep pushing me to do what God wanted me to do from the start, it just took a while for me to listen as well. Click On Any Irish Music Video To Enjoy!